Millions of Americans use 401(k)s as a retirement savings tool, and one of the main reasons why is that these plans can provide their users with lots of tax flexibility. For example, savers who anticipate being in a higher income bracket later in life can utilize a Roth 401(k), which allows participants to potentially reduce their post-retirement tax liability by paying taxes as they contribute rather than when they start to make withdrawals. To put this another way, Roth-style accounts provide a way to lock in current tax rates and hedge against an unexpected tax rate spike, a growing risk as the fiscal strain associated with Social Security and Medicare continues to increase. Earlier this week we looked at recent growth trends in 401(k) account balances, and that same report from Vanguard also revealed that the adoption of Roth-style 401(k) plans continues to rise rapidly. Specifically, the percentage of plans offering a Roth feature has jumped from 49 percent in 2012 to 65 percent at the end of last year. Take-up rates have also risen during the past few years, albeit to a lesser extent (10 percent in 2012 vs. 13 percent at yearend 2016). 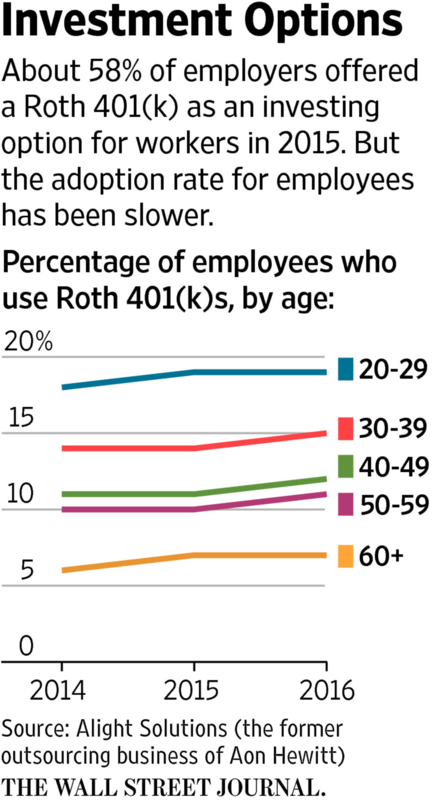 The report’s authors observed that plan participants who utilize Roth 401(k)s tended to be younger and shorter-tenured employees. Thirty percent of Roth participants, for instance, were in the age cohort of 34 or younger, while only 12 percent were age 55 or older. That makes sense since the Roth structure is ideal for individuals with a very high probability of winding up in an upper income (tax) bracket down the road, e.g. young adults that have yet to reach their peak earning power.